Welcome home! This turnkey home is waiting for you! New kitchen with white "soft close" cabinets, quartz counter tops, new stainless-steel appliances: range, microwave, dishwasher and refrigerator! Freshly painted walls accent the vaulted ceilings and hard surface flooring throughout. Neutral tile in kitchen, family room, dining room and living room. Newly installed laminate flooring in both baths plus all 4 bedrooms. Section 1 termite clearance is complete., New cabinets, sinks and faucets in both bathrooms; new closet doors in all 3 secondary bedrooms. New slider and windows and new "top down, bottom up" window shades, plus newer central a/c and forced air heat to keep comfy in any climate. Beautiful low-maintenance landscaping in the front yard and fully fenced backyard with large covered patio. Left side of house has paved gated driveway for RV, boat or other toys. Even the garage has been drywalled and resurfaced for your convenience. Located five minutes from I-15 and close to shopping and entertainment. 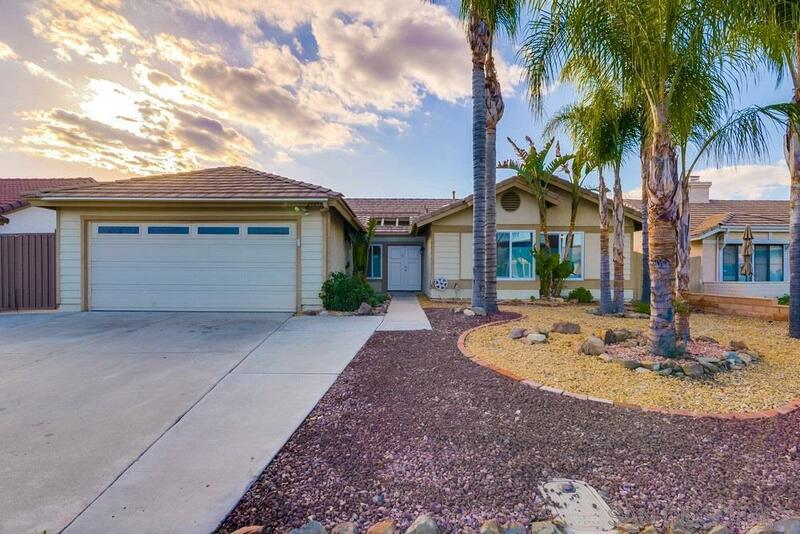 This fabulous single story rancher is waiting for you!